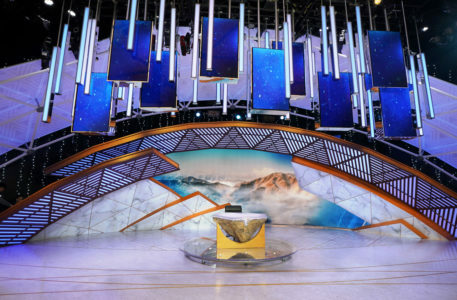 Blackwalnut started working on NBC Sports’ PyeongChang Olympics sets just a few months after the close of the 2016 Rio Summer Games. Blackwalnut was charged with fabricating the studio environments for NBC’s Olympic coverage. First up was Studio 1, which features an internally lit, deconstructed geodesic dome. The solutions+ drafting team at blackwalnut worked for several weeks prototyping build techniques and looking at dome structures before settling on a custom-designed aluminum hub-and-frame system. Drafting was led by Justin Kennedy-Grant, BW’s Director of Drafting. Tight coordination between teams was key. Lighting designers Steve Brill and Dan Kelley of LDG built a complex and color-shifting lighting scheme that required detailed mapping and control of the internal LEDs in the dome and support structure. Blackwalnut custom-designed and installed the local control, pre-wired during the shop build and tied into LDG’s control onsite in PyeongChang. Photos courtesy of NBC Sports / blackwalnut. The Studio 1 environment also features a rock wall that extends under a clear plexiglass deck. The rock was built up, carved and finished in sections in the States with help from Hilbolic Studios and reassembled in Korea. Blast lines were designed into the walls to help with seams and structure. 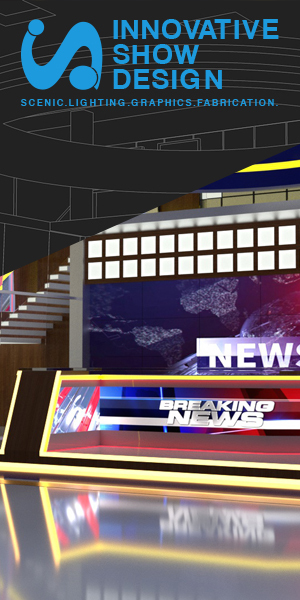 The focal point of the studio is the anchor desk, designed as a single boulder with an ‘ice-finished’ underlit plexiglass lid. BW Managing Partner Mike Van Dusen and Project Manager Lee Martindell hand-carved the boulder and lid with Bryan Higgason standing by. Next up for BW was Studio 2 — also known as the Rooftop Studio. Fabricating a log cabin in a temporary studio structure on the roof of the International Broadcast Center posed some interesting challenges, not the least of which was the mid-winter installation. Blackwalnut engineered the studio in advance as timing was key: the rooftop wasn’t going to be ready until just a few weeks prior to the Games. The logs are fabricated concrete EverLogs machined, fitted, and finished by blackwalnut in their shop and transported to the site on pallets to install once the studio walls were constructed. Perhaps the defining characteristic of the rooftop studio is the spectacular view of the Alpensia ski bowl, the Ski Jump tower and Sliding Course that sit just behind the IBC. The view, equally clear in daytime and nighttime, is made possible by Rosco View polarizing panels specified by LDG and installed by blackwalnut. 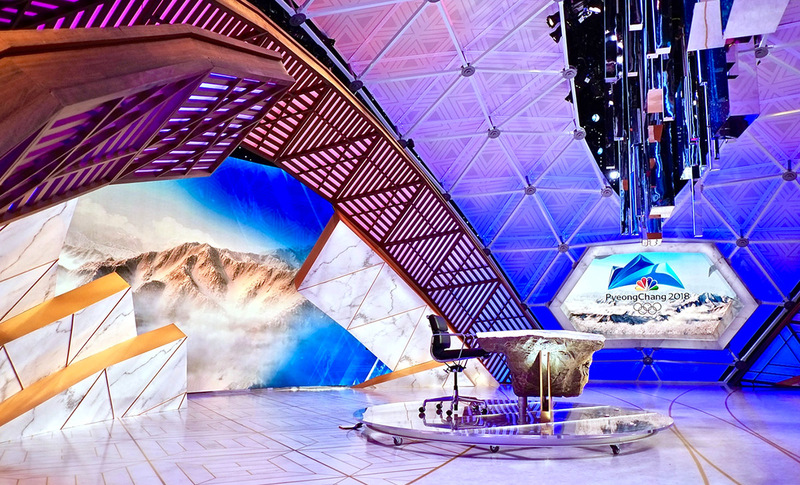 Those same Rosco View panels were key to the success of the NBCSN studio at the Olympic Park in Ganeung, home to the hockey and skating venues. That space overlooks the Olympic plaza and venues, so clarity of the windows was vital. The studio features white angular walls and slatted sliding panels based on the triangular motifs featured in Studio 1 and characteristic of Korean design, which are also reminiscent of the angular faces of ice floes. “I think of it as a view through the interior of a glacier,” BW’s Gendelman added. The onsite installation started in November with a Christmas break for blackwalnut’s international onsite team, drawn from the UK, Poland, and the US and led by BW installation director Phil Gonzalez. They’ve completed projects on five continents and in 13 countries — quite a resume. Project Management in the shop was led by projects+ team member Lee Martindell and overseen by BWs Director of Project Management, Frank Bradley.